This First annual Autism Festival event will present the autism community with a unique opportunity to come together and exchange experiences and challenges while ensuring that the kids, -the subject of the event- are having fun and entertainment. The Festival will provide a center for information for parents, providers and the Autism community at large by providing opportunity to local, state and federal providers, Autism professionals and agencies to present products, services and information that are tailored to the needs kids with autism. All Kids of all ages, parents of all ages and autism providers of all kinds. 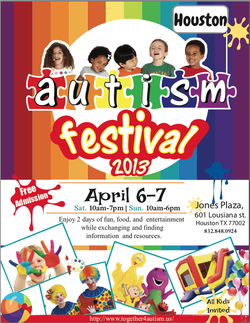 We are excited to announce that the First “Houston Autism Festival” will take place April 6 & 7, 2013. 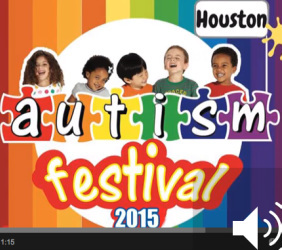 The Festival is sponsored by the “Together for Autism Foundation”, a young local organization founded in the Houston area for the purpose of creating fun events for children with Autism as well as putting together resources available for those children and their families. child in 88 children in the Nation. and exchange experiences and stories. effort of both parents and providers can be reduced.